The Macron Implosion – Will it Spread to Other EU Members? There are tanks in the streets – not seen for at least ten years – burning cars and shop fronts, vandalized buildings. The police are fighting them with teargas, water cannons and rubber bullets. Police brutality seems to be unavoidable, However, apparently more moderate than on other occasions. Nevertheless, a youtube is circulating, where a group of riot gear protected police beat up a helpless Yellow Vest, already on the ground and defenseless. These are the pictures you see on TV. And the globalized ‘everybodies’ throughout Europe and the (western) world sit comfortably in their fauteuils, shaking their heads – “the French again; they are never content, always want more” – having apparently no idea that what they, the French workers, had rightfully accumulated in terms of social funds and public infrastructure – hospitals, schools – since WWII (instead of paying for a heavy army) is being ‘legally’ stolen by a small elite who put a Rothschild banker – Macron – in power to pass the necessary legislation to make the fraud legal. Voilà. So simple. Most of the fauteuil warriors have no idea that the hangmen are stealthily coming to them too. By the time they wake up and see the light irradiated by the French Yellow Vests – it might be too late. It’s not for nothing, that Europe, under the command of the unelected European Commission (EC), has become increasingly militarized and a conglomerate police state, to be ready when general discontent spreads and political and social upheavals start. We may be at that point. For now, the Hot Spot is Paris, in particular the lush Champs Élysées, symbol for the rich and powerful, the French elite. But the movement is spreading rapidly to other cities in France – and would you believe, to other EU countries, like Belgium and the Netherlands. They have seen the yellow light and realized that what the French claim back has been stolen from them too. The malaise is not just French, Belgian, Dutch or German, but of course, also persists in Spain, Portugal, Italy and Greece, the latter countries and people about whom you hardly hear and read anymore, they are done with. The banking cartel has them under control. No public attention needs to focus on their plight anymore. Except for Italy, their brazen resistance to Brussels, is still a problem for the kings of finance. – Chapeau Italy! The discontent is everywhere; the result of a shameless neoliberal assault not only on people’s democratic and constitutional rights, it also prompts an increasing awakening to a reality of economic and financial fraud committed in front of your eyes by the globalized financial mafia – banks, insurance companies, investment corporations of all hues – milking workers’ rightfully accumulated social capital, like pension funds, unemployment benefits, free education, national health care, public hospitals, access to subsidized essential drugs – and so on. All that is being shredded by the financial fraudsters. But you need political leaders to facilitate the process. Macron is the perfect choice to do so – and he has done so royally, starting with the highly unpopular and contested labor reform. 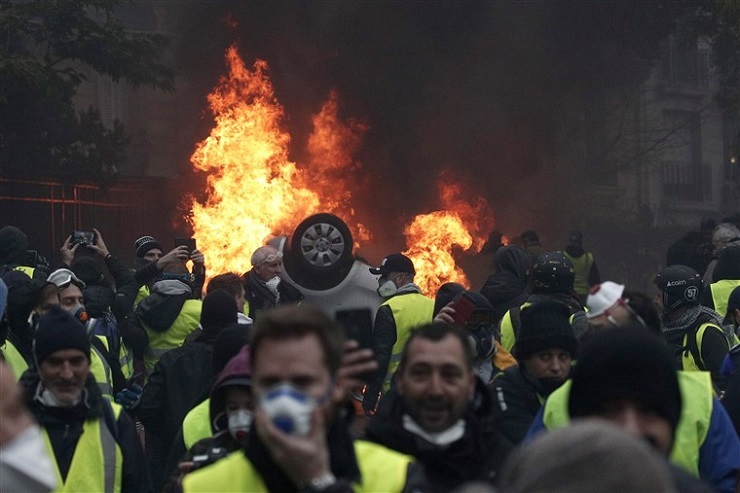 So, clearly, the Yellow Vest movement has little or nothing to do with the Macron introduced new French fuel tax. The tax was a mere pretext. The so-called eco-tax was a mere political-propaganda tool, a brazen lie. The tax would not have served any environmental initiative in France, but simply been a forced people’s ‘contribution’ to the budget, ever more depleted by Macron’s austerity programs. He wants to impress his ‘employers’ – austerity is the name of the neoliberal game. Besides, under people’s pressure, Macron has finally withdrawn the tax, a concession made to ease the street demos. But it didn’t work. Because it’s simply not enough. The discontent reaches way beyond a fuel tax. It has to do with the overall decreasing standard of living, coupled with declining wages, a new Macron-imposed usurping labor law, and social benefits in France – and actually way beyond the frontiers of France. In fact, French Police support the Yellow Vests they have to fight. They have recognized that they Are part of the people who demonstrate; they have the same concerns. Interestingly, RT reports that the police are exercising a certain restraint with the use of teargas, water cannons and other acts of aggression you normally observe in cases of relentless protests, like the ones currently ravaging France. For sure, there seems to prevail great sympathy for the protesters among the police, but staged provocations by the government could bring about more unrest, where the police would have no choice other than to intervene with force – or else, under a State of Emergency which Macron’s Interior Minister, Christophe Castaner, was compelled to declare, the army could be called to intervene. And in this case the French Government would not be far off in calling NATO for help – of course, in the “Interest of the larger good for Europe”. Come to think of it – NATO. Wasn’t it Emmanuel Macron, who called a few weeks ago for an independent European army? That would make NATO obsolete – well, or would it? If taken by the letter, NATO has been obsolete for the last almost 30 years, but of course, nobody takes NATO by the letter. NATO is a killing force for the empire, and a huge trillion-dollar profit-making proposition for the US military industrial complex. So, when Macron called for a European army, he may have upset some very violent interest groups, those who literally make a killing from killing. He may have gone a step too far in his imaginary role as King Macron. There are bigger kings than he is. A European army would most likely be armed by European weapon manufacturers, mostly from France and Germany – and – god forbid – perhaps even Russia? – This would be logical, since Russia is really no enemy of Europe, as every politician in Europe knows, even if they don’t dare to admit it. Also, Russia’s arms, especially long-range ballistic systems and Russia’s S-400 Air Defense System, are far superior to the US variety. Hence, partnering with Russia would not be rocket science, though certainly less than appreciated by Washington. Could it be that the divided ‘deep state’ is at odds over Macron? The financial oligarchs put him in power to milk the French social system to the bones, then impressing other European nations with Frances over-board austerity programs to do likewise. If successful, Macron would indeed become the financial mafia clans new King of Europe. On the other hand, the self-centered youngster Macron, may have taken his role to heights not foreseen – suggesting an independent European army, something no European leader dared even to whisper, since General de Gaulle proposed exactly that, in the 1960s – it didn’t happen – but he then exited NATO anyway. Could it be that military industrial oligarchs want Macron gone? – Could it be that the Yellow Vests protests, though starting on genuine premises of ‘enough is enough’, were gradually converted in an orchestrated effort to push public hatred for Macron to a point where he is no long a tenable leader even for the French Parliament in which his party, or rather his movement, “En March”, has the absolute majority? This remains to be seen. It would not be the first time that demonstrators are paid to demonstrate – and especially if it’s for a noble cause to get rid of an uncomfortable politician. In the end, it’s all for the good of the people, right? Isn’t that democracy in its fullest, being played out in the streets of France – and soon to come, hopefully in the streets of Amsterdam, Brussels, Berlin, Rome – maybe even inspiring the so far rather timidly quiet Spaniards, Portuguese and Greek? – Could that perhaps be a movement that goes way beyond what the ‘instant-profit’ thinkers – the NATO sponsors, the producer of US killing machines – have thought of and wished for, namely the breaking up of the already defunct European (non-) Union with her unsustainable common currency, the Euro? This of course, is all hypothetical, but not impossible. Dynamics play odd games. Just think of France becoming the front-runner again for a Revolution – 230 years after the Storming of the Bastille – bringing a new order into nation states, away from globalization – and maybe back to sovereign governments, building up new trading relations and partner alliances on a basis of equality, rather than imposed by a one-polar world order.